We have enough youth. 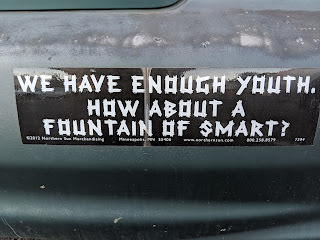 How about a fountain of smart? For a long time I gave up broadcast television. I'm afraid I was a little (or a lot) "less-viewier-than-thou." Grin. I've since gotten back on the bandwidth wagon. The commercials do annoy me, but if that's what it takes to watch The Voice or various flavors of NCIS or Bull, so be it. (I just have an over-the-airwaves antenna, so no pausing for me.) (& I purposefully have NOT signed up for streaming services, as I already watch as much TV as I want to fit into my schedule by taking in what's limited-ly available.) So, commercials it is. This could be very commercially successful! Bite-sized chunks. I couldn't write during commercials, but interruptible tasks are great. 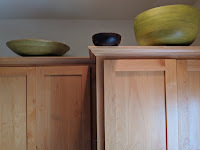 Cathy Tenzo, who is also in decluttering mode told me about an article from Miss Minimalist. I'll put the link at the bottom, for anyone who wants to take a look. The theory is basically that we have fantasy selves with baggage. Perhaps one of them is a crafter. Or a knitter. Or does drag. One of my fantasy selves has--had, as the photo from above shows the bottom of my garbage can--a bunch of makeup that I never wear. Not that I don't wear makeup. I do. Eyeliner. Specifically, Avon Glimmersticks. (But not the waterproof kind.) Pretty much always when you see me I will be Glimmersticked. Glimmerstuck? But mascara & blush & lipstick? Nope. I thought about keeping some of it for a while, having a playdate with my glam imaginary self, but none of the makeup is very new (in fact some of it came from when Katie Stehn & I tried out for Rocky Horror Picture Show in Rochester, Minnesota, before I moved to Asheville, North Carolina, in 2006) (& some of it is older than that) so I just let it go. 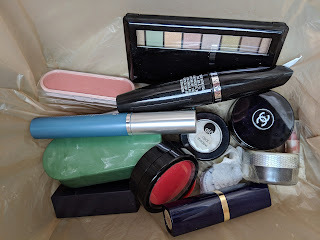 I take that back: I have some assemblage ideas for the nifty little cases that some of it came in, so I scraped/washed the makeup out. But I have an expiration date. If I haven't used them to make cool things by June first, they're gone. I think the expiration date for art supplies may be a good idea & I intend to apply it to other things as well. 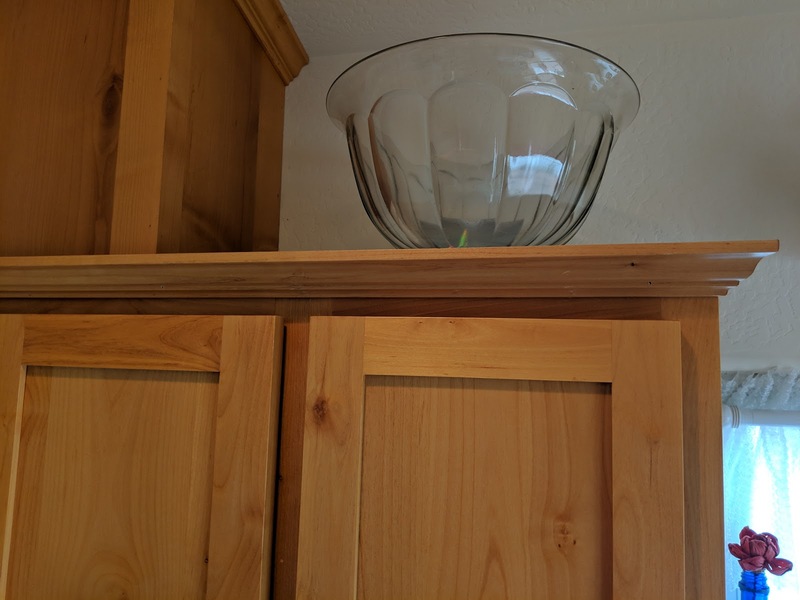 I have bowls on top of my cupboards. Every time I look at them, or think of them, I feel the words I have assigned to them. I imagine those concepts spilling from them, filling my home, my city, my planet, the universe. Two are bamboo, one is wood & one is glass. Peace is a shallow bowl. It doesn't take much for it to spill out. A moment of alignment. A breath. Prosperity is deeper. You have to trust the workings of it, know that it's rising &--in good time--will overflow. You have to trust that you don't know all the ingredients. It's there when you can't see it. Mystery. A tiny dark wooden bowl. Every life needs mystery. But perhaps not as much as some of the other necessary things. Grin. Inspiration is crystal clear, comes in & out from the sides as well as from overflowing. I wish for you Peace, Prosperity, Mystery & Inspiration. 320. Put a container, small or large, in a high place. (Sure, it can be an imaginary container!) What would you have it spill out into your life--& into the universe? Spoiler Alert: Boring story. Nothing much happens. Yay! This is a picture of my mommy & daddy at Christmas time. Laughing & happy. 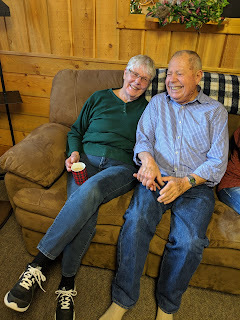 But my dad was having some issues with not feeling up to par so he was scheduled to have a looksee (technical term) in the bloodways (another technical term) around his everloving (& that's a lot of loving) heart. If they found blockage, they could potentially put in a stent. Cathy Tenzo made me laugh when I told her about it. "I hope it's a boring story," she said. As in, nothing much happens & the characters don't get too stressed out & there are no plot twists or complications & then someone eats a sandwich & watches TV & goes to bed early. I had the feeling it might be that because my brother Mikol was going to call me if there were problems & wake me up, but if it was all copacetic, he was going to just text me & let me wake up at my own time. Yay, hurray, that's what happened. No drama. One longish stent that took care of 2 blocks. Everything seems to be going well. He should be feeling better after this. 319. Tell yourself a story about some upcoming event that's been on your mind. Make it really boring. No drama. No hoohaw. No folderol. I came, I saw, I sat on a park bench with a delicious snack after it was all over. I didn't litter. Went home satisfied, in time to see Vanna's dress on Wheel of Fortune.